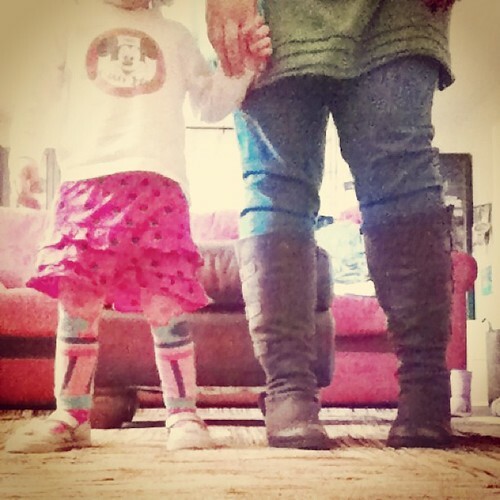 new rug + timer setting on camera+ app + her joy + these boots over jeans was the beauty of a moment on friday afternoon. the picture isn't perfect because the lighting was very dim...i might have overprocessed it a wee bit by accident because i sometimes forget how camera+ works...but i didn't want to forget how proud she was to stand still and hold my hand because "the timer is going!" and how her laughter is contagious and how much we both love the new rug and how darn happy these new jeans that fit in my boots make me feel. getting us both in the photo makes me happy. remembering the laughter and joy is what matters. i imagine a lot more photos like this one in our future.